Bhubaneswar: The investiture ceremony of Sainik School Bhubaneswar was held with great enthusiasm and grandeur. 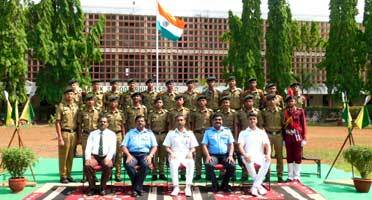 On this occasion 18 cadets took oath who shouldered different responsibilities for the new academic session. 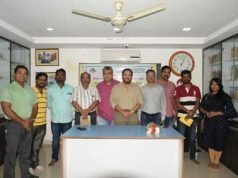 DIG Atul Agarwal, Commanding Officer, Coast Guard Air Enclave Bhubaneswar graced the occasion as Chief Guest and awarded ranks to the School Appointments. Group Capt S Dominic Rayan, Principal, Sainik School Bhubaneswar received the Chief Guest in presence of Wg Cdr Amitabh Ranjan, Vice Principal, Cdr N Santhosh Kumar, Administrative Officer, Senior Master, NCC Officers, staff and 600 cadets. In his address to the cadets he exhorted to the cadets to dream high and follow the path of truthfulness, honesty, punctuality, dedication, obedience, sincerity etc. that are missing among the new generation day by day. He also asked them to inculcate comradeship, fellow feelingness and extend honour to teachers & parents. 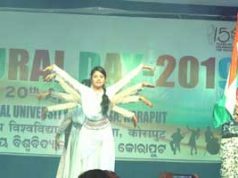 The Chief Guest appreciated the school fraternity as this institution has been serving our nation since 1962 as a nursery of officers for Armed Forces. Eventually Sri Sujay Kumar Pradhan, Senior Master proposed Vote of Thanks.